I’m working with the Census Bureau’s American Community Survey (ACS) data which are samples (not complete enumerations) aggregated at different spatial scales. Each ACS estimate is provided with a margin of error (which is easily converted to a standard error, SE). I’m attempting to generate a regression line ‘envelope’ by randomly generating X and Y values using the estimated values and associated SEs. 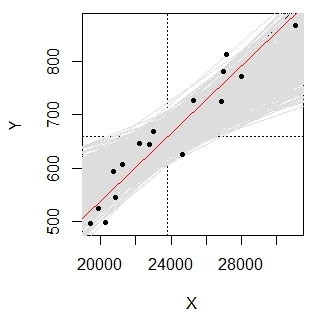 In other words, I want to see what the regression line might look like given the level of uncertainty associated with both the X and Y estimates. Is the MC approach I’m taking a good one in estimating the range of regression lines? If so can a standard regression model be used in the MC subroutine (assuming of course that pertinent data distribution requirements, other than a fixed independent variable, are met)? How should I estimate the central regression line? I’ve come across some R libraries such as Deming and Model II that seem to address my problem, however, I don’t see an option in those routines that take into account each X’s SE values. But more importantly, I don’t fully understand what it is that those functions do exactly. Any lucid perspective on this would be greatly appreciated. Browse other questions tagged r regression census or ask your own question. Why does linear regression use a cost function based on the vertical distance between the hypothesis and the input data point? How to fit a line to data using weighted least squares (WLS) regression?